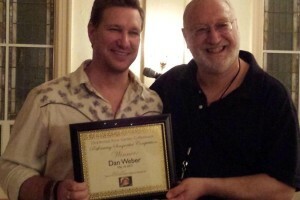 Award Winning songwriter Dan Weber has been described as “The Classic, Mid-Life, Overnight Sensation.” A gifted storyteller and inspiring performer, in 2014 he Won 2nd place in the prestigious Woody Guthrie songwriting contest and was honored to become a rare 2-time finalist in the legendary Kerrville Folk Festival ‘New Folk’ competition. In 2014 he also received several other national songwriting contest honors. 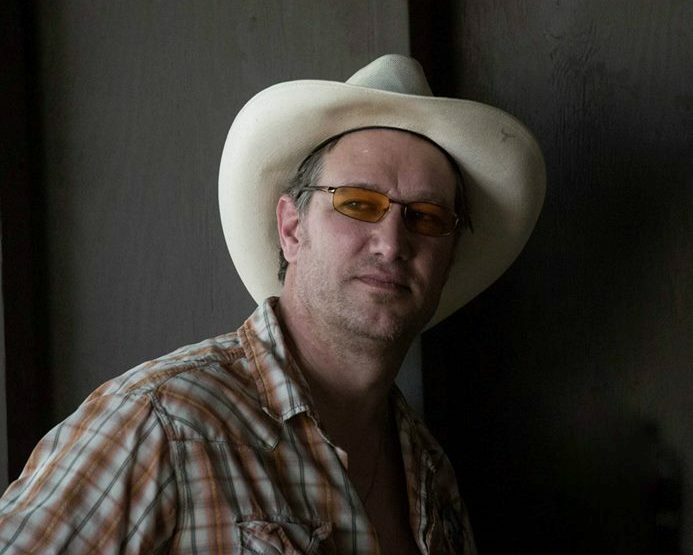 An ex-Park Ranger, Eagle Scout, ‘recovering’ Altar boy and lifelong ‘Deadhead’, he left his hometown of Rochester, NY in 1989 in a beat-up primer grey ‘78 Pontiac Trans-Am with a ‘guy named Joe’ he’d met in a bar the night before, and never looked back. 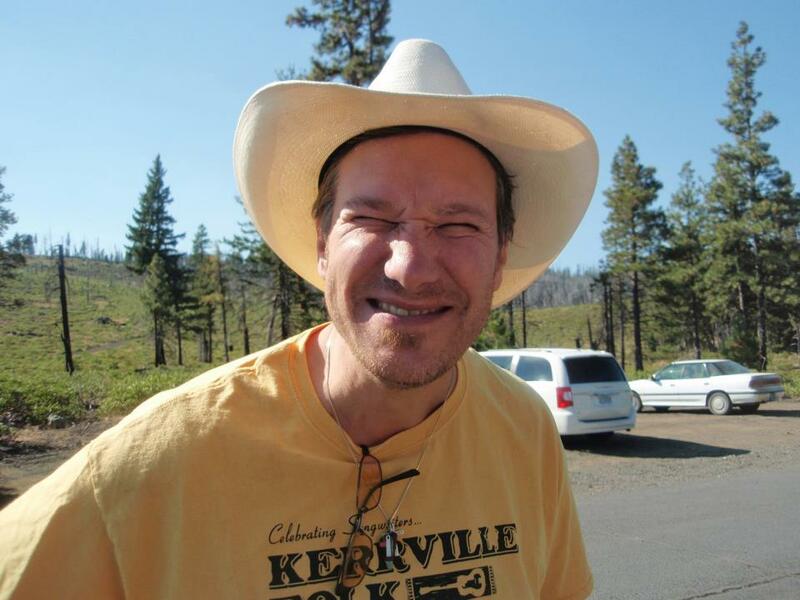 Living first in Seattle, then in a sheepherder’s trailer in Utah’s remote Canyonlands National Park, he eventually moved to Portland, OR, and settled in a 1948 shipyard worker’s house in Vancouver, VA. Along the way he picked up stories and hitchhikers and eventually, picked up a guitar. 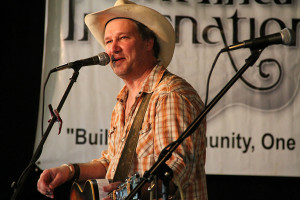 Weber began performing at 40 and in a few short years was winning over audiences with energetic performances and hilarious stories from the roads he’s traveled. None other than legendary Folk troubadour Ramblin’ Jack Elliott said “I love Dan’s songs and he tells really good stories.” His songs have been described as ‘Timeless’ and ‘Authentic’ and his debut CD ‘Ash and Bone’ received accolades from American Songwriter Magazine and the UK’s Maverick Magazine said: “4 Stars: Has you hanging on to every word. That’s the touch of a true Master Craftsman songwriter.” There’s also been recognition from DJ’s: “’Hank and Jesus’ is easily the best folk song I heard last year” and The Victory Review magazine wrote “Weber's writing is as strong as any in the Contemporary Folk community. 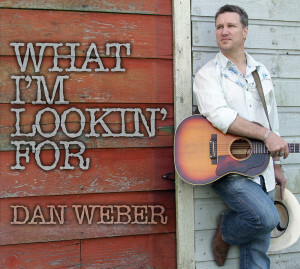 ‘Goodbye to Dad’ is one of the best original tunes that I have heard in a long time.” In 2015 Weber begins a new chapter with ‘What I’m Lookin’ For’: A 14 song CD of classic Americana that includes the stirring Folk tribute ‘Oh Woody’, Country-Roots on ‘Cowboy Style’, Bluegrass banjo/Dobro master Tony Furtado on several cuts, and the crowd sing-a-long favorite ‘(I Deal with) Crazy ALL Day’, an everyman’s anthem that is poised to be a breakout hit. That same year, 1989, is when I set out on my own and left my hometown of Rochester, NY. My Dad was 55 years old—close to my age now. In September he was diagnosed with lung cancer and sadly he died a month ago at home on a cold morning in January. Dad was my hero and a remarkable guy, and I so was honored to give part of his eulogy, no matter how hard that was. I told a funny story about how we got heavy leather hiking boots as Boy Scouts and Dad took us to the local zoo to break them in. He’d read somewhere that getting them wet and walking in them would help. So there we were, walking around with full backpacks and new boots on, wading in the duck pond at the entrance to the zoo, looking totally ridiculous. It’s still funny thinking about it, but our boots did eventually get broken in. I guess no matter if it’s Grandma’s saving bonds or the lessons that Dad taught us, it’s pretty darn cool that even though they’re gone, they’re still trying to take care of us. What’s ALSO cool is that after a long-ish dry spell I’m writing new songs again! For a while now I’ve had 40 or more songs to pick from for a new record (or 2?) but the truth is that making CD’s is increasingly complicated/difficult in the age of Spotify, Pandora, etc. I don’t know where that leads me but I am really enjoying breaking out some of the news songs at my live shows and mixing them amongst the older favorites. With a few exceptions I don’t play much off of ‘Ash and Bone’ anymore but I do occasionally love to revisit those songs. Might be time to re-learn a few! I know that somewhere along the line you came to a show and let me tell a few of my stories and sing these songs that mean so much to me. Thank YOU! I so appreciate that. I try not to fill up your inbox more than twice a year because I know that’s like. Hopefully I’ll see you at one of these upcoming shows again soon—and hey, bring a friend—they’ll have a blast too! I’m working furiously on booking a Northeast tour in September 2019 (New England, Pennsylvania, New York, Ohio, etc. You name it! Back to the Midwest (and Mid-Atlantic states) in March-April 2020 so I could REALLY use your help! I’d love to hear where I should try to play, or where you’d like me to play. 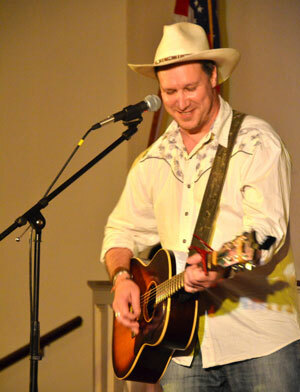 So many of you have seen me at a House Concert and know how intimate, cool, and an amazing that experience can be. 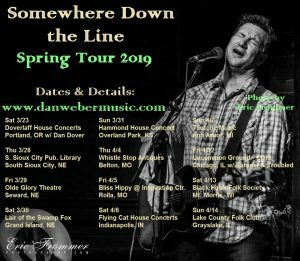 They’re fun and easy to host so if you’re thinking ‘I’d like to have a House Concert!’ drop me a line at: dan@danwebermusic.com—and let’s talk!! Lastly, I wanted to say ‘THANK YOU’ again for all the support. So many great things have happened in the past few years and every bit of ‘success’ I’ve has come because folks have embraced me and I’m so Grateful to all of you who’ve helped me chase my dream a bit. 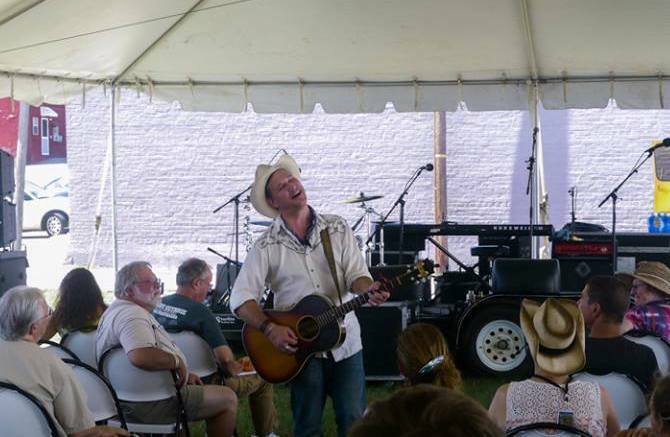 THE most rewarding part is playing the shows and meeting folks all over the country and getting to know them. I meet so many Wonderful people and your hospitality and kind words are what keeps me going. It’s as Simple as that. So ‘Thank YOU!’ for Listening, Reading, Sharing, and Helping me make this long, Crazy musical journey of mine possible…I’m really humbled by your enthusiasm and show of support. Note: As always, some show details change or are in the process of being confirmed, so check back on the website for info. on specific venues, times, etc. at: http://danwebermusic.com/shows/index.html And you could also might check on my Facebook page as well. Kickin’ it! @ the Grand Re-Opening of Artichoke Music in Portland, OR. Photo by Elizabeth Campbell. I came home off the road 2 months ago and old man winter in ‘My Little Corner of the World’ in Vancouver, WA was in full swing. Grey leaden skies. Rain turning to showers. Then more rain. Rinse and repeat. Then we had one magical night of snow, on Christmas Eve. Then the rain came back, it turned to ice, and a truck crashed into my car on Christmas morning. Merry Christmas! Lately it seems that everyone is in full panic mode over the State of the Union speech, the freefalling stock market, or Facebook changing their infamous ‘algorithm’. So I’m taking an unusual degree of comfort in the same old rainy Pacific Northwest weather algorithm: Grey skies and rain. Expected to continue. Rinse and repeat. I turned 50 last year on ‘9-11’ and thus it seemed like the right time to take stock, clear my head and decide what exactly I wanted to do when I ‘grew up’. Being my father’s son, the simplest solution for clearing one’s head was to do some manual labor. His famous salve for all that troubled him was either vigorously raking leaves or sweeping. He excelled in both but was an Olympic level leaf-raker well into his 70’s. At one month removed from the hospital for a series of blood clots in his lung he complained to me that he could ‘only rake for 2 hours’ instead of his usual 4. In my case I clean and/or organize things. But like him, then I sweep. So I started in the most logical place, the garage, which is a detached single car 1940’s deal that you can’t actually fit a car into. Or much else, except 20 years of clutter. I went to start moving some firewood out of the way and thought “That’s it—I’ll build a woodshed!” So I did and just finished it yesterday. It’s over engineered, over-built, and might withstand a small hurricane. I spent a lot of time measuring, cutting, re-measuring and dodging all that January rain in and out of the garage where I worked. And in doing so, I had more time to myself and more time to think than I’ve had since I was a Park Ranger in Canyonlands National Park, 25 or so years ago. I thought a lot about where to go from here. I thought about the more than 40 songs that I had ready for a new CD a year ago and then ‘life happened’. I thought maybe I should put those songs to rest and start over, just write a new batch. And I honestly gave a fleeting thought that maybe I should just ‘hang it up’, take up woodworking—after all, I WAS kind of getting the hang of it! But more than all that, I mostly thought about all the cool places I’d been in the past 5 years since I started touring and all the wonderful new friends I’d made along the way. Folks like YOU. The touring life, for what it’s worth, for all its long miles, weird motels and bohemian up and downs, was something I’d never thought was a possibility and yet somehow it’d become a reality. And the best part was the friends I’d made and the stories that went with them. Then we had our first warm spell this week. The annual February ‘tease’. Up the block I heard the first lawnmower of the season. Later I noticed that the incredible scented Daphne along the chain-link fence had started blooming—after all that rain—finally a sign of Spring! So damn the algorithm’s. The heck with the State of the Union. Let someone else worry about the stock market. 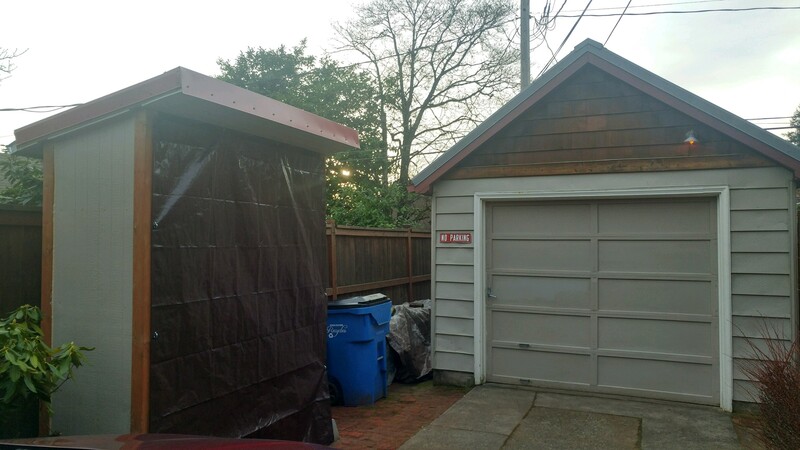 Yesterday I finished the shed. Even loaded it up with wood. Then of course, I swept. I have a handful of mostly local shows coming up, then I’m headed back to New England in August-September. If you have a house and always wanted to do a house concert, let’s finally make it happen!! 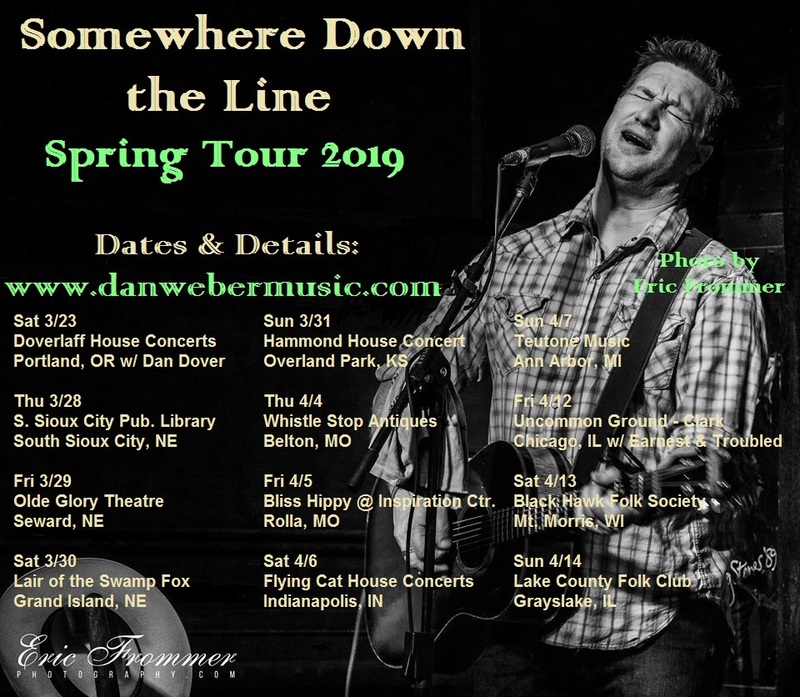 Then I’m booking a Spring tour in March-April 2019 in the Midwest. Come see a show and if you can’t please tell your friends and family in those parts—I’d Love to see them at a show and meet ‘em!! 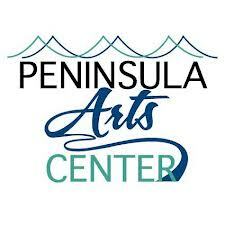 Also—Saturday at 11am I’ll be on KBCS, 91.3FM, playing live on ‘Our Saturday Tradition’ with host Larry Lewin KBCS is a great, non-commercial, listener-supported station located at Bellevue College. Listen in! Note: some shows are still in the process of being confirmed, so check back on the website for info. on specific venues, times, etc. at: http://danwebermusic.com/shows/index.html and you might check on my Facebook page occasionally as well. Hey BTW–If you have a favorite local venue you’d like me to play at or would be interested in hosting a House Concert (which ARE the greatest things since sliced bread! ), shoot me an email, let’s talk!!! It’s been a ‘cool’ summer so far here in the Pacific Northwest—not so good for my tomatoes and peppers—but it’s been good to be back at home and write some new songs that I’m really excited about. 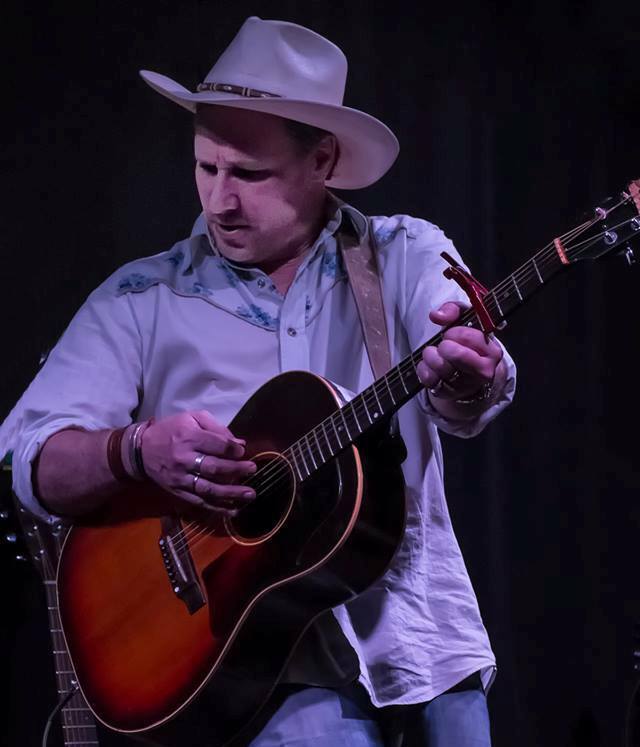 I had some wonderful shows earlier this year in the northeast around Boston, then a great Midwest jaunt and finally this spring in Dallas, Tucson, Salt Lake City and in central Texas. 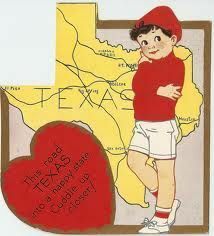 So after that—and after a CRAZY 2015—where I crisscrossed the country, played in more than 25 states (and after the release of ‘What I’m Lookin’ For’, rose to #6 on the Folk DJ charts and ‘Oh Woody’, my tribute to Woody Guthrie, for a time rose #2 on the charts! ), I was ready for a little break. I’m really excited for this current crop of shows! I’ve been working some new songs into the sets, keeping most of the old favorites and even reviving some older ones. One new song in particular, titled ‘Ever Since Columbine’ has really been getting noticed, including a spot on the news in Tucson. It’s touched it nerve for the folks who’ve heard it and I guess there’s no finer compliment then when people are moved by your songs. Maybe the only thing that compares is when people take a night off to come out to a show and spend the evening with you. I feel so lucky to have played so many great shows and fun festivals and meet so many of you. That’s really STILL the best part of for me—playing the shows. So I really hope to see you at a show soon! Bring a friend or 2, or tell a friend if I’m playing their town. Thanks!! I hope this finds you enjoying the long, warm days, and maybe taking some time off yourself. You know you deserve it!!! Lastly, I wanted to say ‘THANK YOU’ again for all the support. Every bit of ‘success’ I’ve has come because folks have embraced me and I’m just grateful to be able to chase my dream a bit. THE most rewarding part is playing the shows and meeting folks all over the country and getting to know them. I meet so many Wonderful people and your hospitality and kind words are what keeps me going. It’s as Simple as that. So ‘Thank YOU!’ for Listening, Reading, Sharing, and Helping me make this long, Crazy musical journey of mine possible…I’m really humbled by your enthusiasm and show of support. I’m Super-Excited to be playing the American River Music Festival outside of Sacramento in Coloma, CA—AND, I’m also the ‘playing’ the raft trip. Awesome!! 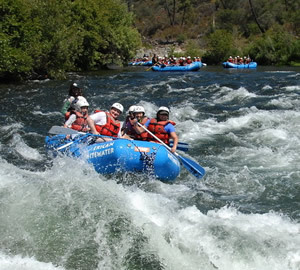 The South Fork of the American River is the most popular whitewater rafting river in the West. It’s known for its beautiful scenery and super fun whitewater. This is an awesome way to add an adventure to your festival experience. Friday, September 16th is the fest river trip guided by American Whitewater Expeditions. AWE has been providing the highest quality South Fork trips since 1979. The trip is a 14-mile class three level float down the famous gorge with a fantastic riverside lunch + music by Dan Weber (3-time finalist at the legendary Kerrville ‘New Folk’ competition). I Hope YOU had a great Holiday Season! I’m still amazed by all of this and more Grateful than you know. When I wrote ‘Oh Woody’ I was thinking about the month he spent in the Pacific Northwest where I live and the iconic songs that he wrote here—like ‘Roll on Columbia’ and wondered to myself if Woody were still alive what would he have to say about today’s issues? And that became the kernel of the song that I got to travel the country and sing for folks all over America. It was better than pretty cool—way better—and I can’t wait to do it again! 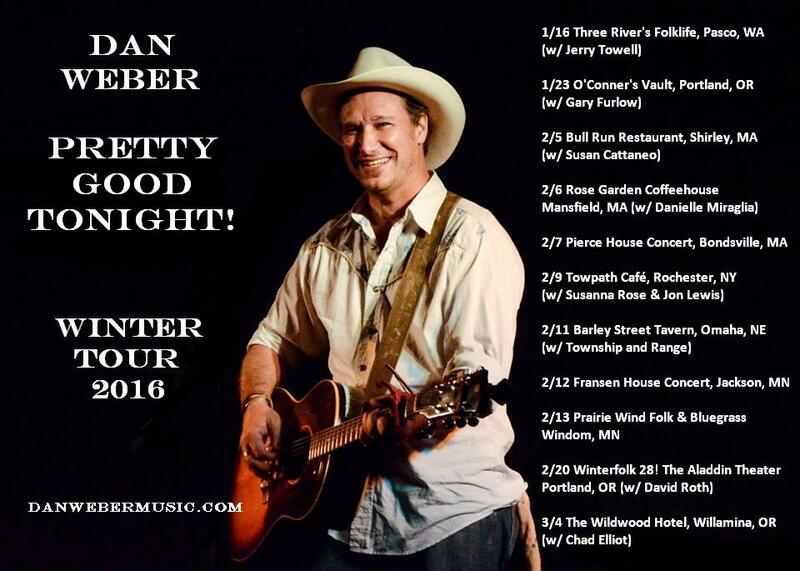 So I’m REALLY excited about this next tour—the ‘Pretty Good Tonight’ Winter Tour! The ‘Pretty Good Tonight’ Winter Tour! Friday February 5th: In Shirley, MA at Bull Run Restaurant http://tickets.bullrunrestaurant.com/default.asp A Co-Bill with my friend Susan Cattaneo http://susancattaneo.com/. Look her up and give a listen–Susan is Incredible! 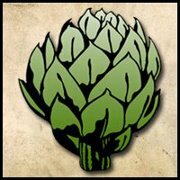 Tickets http://tickets.bullrunrestaurant.com/orderticketsarea.asp?p=1000&a=41&backurl=default.asp are $15 each. Bull Run http://tickets.bullrunrestaurant.com/default.asp is a Historic restaurant that’s been “Serving the tired, thirsty traveler since 1740”. 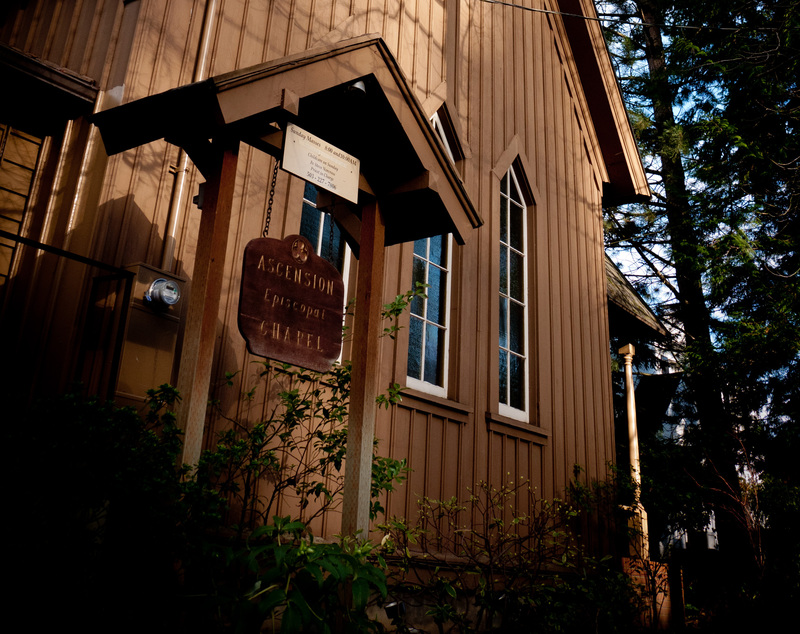 Saturday February 6th: In Mansfield, MA at The Rose Garden Coffeehouse http://www.rosegardenfolk.com/general/home.php A Co-Bill with Danielle Miraglia http://www.daniellem.com/. Danielle is nothing short of Amazing! 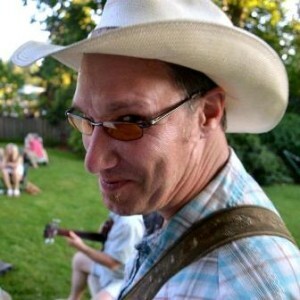 Tickets http://www.rosegardenfolk.com/general/home.php are $16 each. 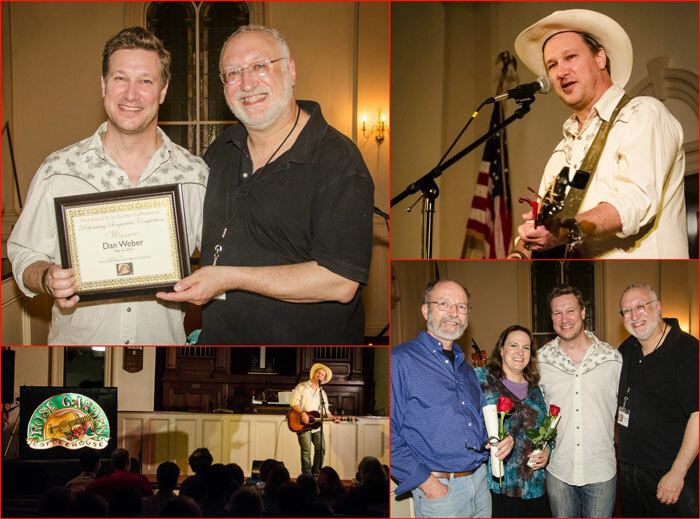 I won the Rose Garden’s Performing Songwriter Competition last May. Tuesday/ Wednesday February 9th/ 10th: In Rochester, NY Live at Mission Hall at the South Wedge Mission http://southwedgemission.org/missionhall/ A Co-Bill with Susanna Rose http://www.susannarose.com/. Susanna has a new CD out and has been recently dubbed ‘The Siren of Loneliness’ http://www.democratandchronicle.com/story/lifestyle/entertainment/2016/01/08/susana-rose-siren-loneliness/78426098/ Cool! 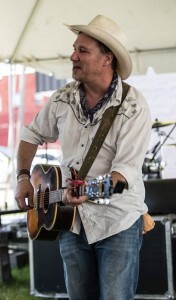 Thursday February 11th: In Omaha, NE at Barley Street Tavern http://www.barleystreet.com/ With Daniel Burns, Travis Linn & Township and Range https://www.facebook.com/TownshipAndRangeOmaha/, Nick Carl, Charlie Alley and Doug Kabourek. No Cover! Saturday February 20th: In Portland: Winterfolk 28! at The Aladdin Theater http://www.aladdin-theater.com/ Headliner: David Roth (with Casey Neill, Sky in the Road, Kelly Bosworth, Richard Columbo, Paul Sanchez and More!). 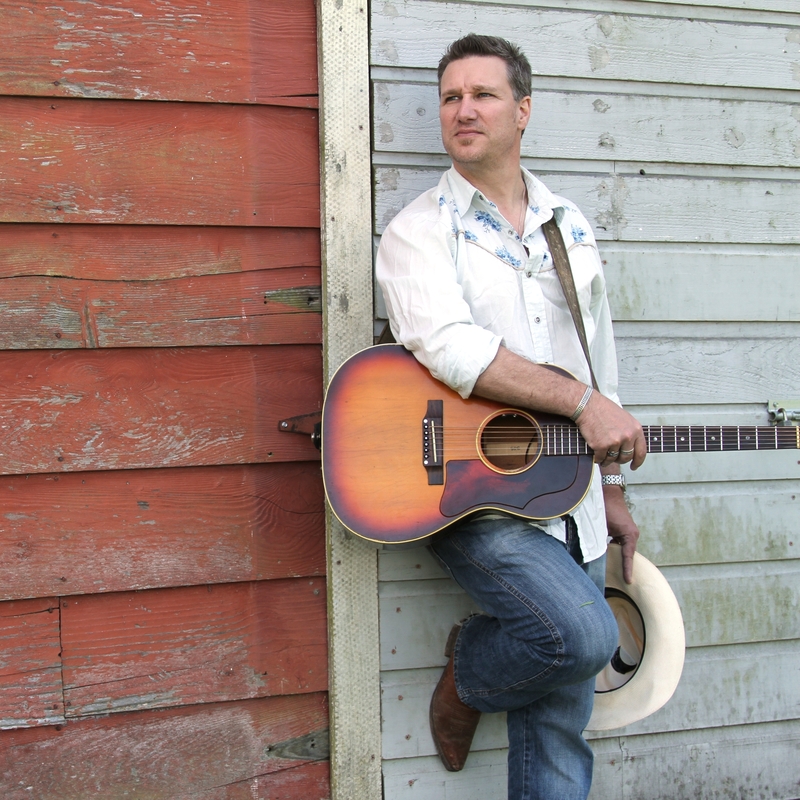 Friday March 4th: In Willamina, OR at The Wildwood Hotel http://wildwoodhotelnw.com/ Opening for Chad Elliot http://www.chadelliott.net/ Chad is seriously the Real Deal! Phew—That’s a bunch of shows. Would LOVE to see YOU at one and if you can’t make it, please Share and tell a friend or 2—Thanks! Lastly, I wanted to say ‘THANK YOU’ again for all the support. So many great things happened in 2015 and even more are happening in 2016. Every bit of ‘success’ I’ve has come because folks have embraced me and I’m just grateful to be able to chase my dream a bit. THE most rewarding part is playing the shows and meeting folks all over the country and getting to know them. I meet so many Wonderful people and your hospitality and kind words are what keeps me going. It’s as Simple as that. So ‘Thank YOU!’ for Listening, Reading, Sharing, and Helping me make this long, Crazy musical journey of mine possible…I’m really humbled by your enthusiasm and show of support. ‘What I’m Lookin For’ has 14 new songs including ‘(I Deal with) Crazy ALL Day’,‘Pretty Good Tonight’ and ‘Oh Woody’, and several you’ve probably not heard before. It was recorded at the same studio as ‘Ash and Bone’ and it’s my best songwriting yet—so I think you’re REALLY gonna love it!! You can pick up a copy at my website where there are links to iTunes, Bandcamp, & CD Baby, etc. Thanks for buying a copy!! ‘Oh Woody’ also rose to #2 (!!) on the National Folk music radio charts this summer. That’s just Incredible. I’ve always felt such a strong kinship with this song from crowds singing it along with me to the message of the song itself and it’s really great to know that folks are hearing it on radio and really responding to it. 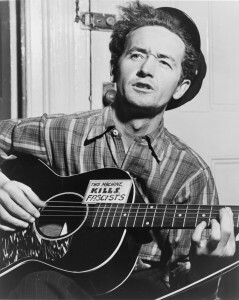 Long Live Woody Guthrie!! 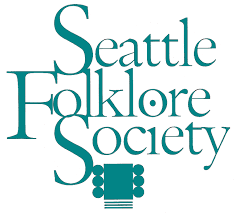 I also have a handful of shows coming up closer to home, including a short set at Artichoke Musicin Portland on October 23rd (with Bob Howard, Matt Mesa, & Alonzo Garbanzo) and at the GREAT Seattle Folklore Society series in Seattle on Saturday, October 24th. 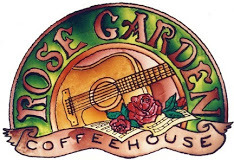 I took 1st Place in the Rose Garden Coffeehouse contest (my 1st win!! 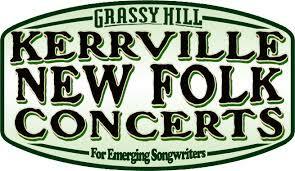 ), 2nd Place in the Susanne Millsaps competition, and was a Finalist in Kerrville ‘New Folk’ (3 times in 4 years! ), and in Tucson (3rd year in a row as a Finalist) and the results of Falcon Ridge will be released sometime this winter (finger’s crossed!). No one I know—including myself—is a big fan of songwriting contests—it’s a pretty weird experience ‘competing’ on what is essentially subjective—songwriting and musical taste. It’s also financially draining, pretty stressful and usually involves a hefty dose of ‘rejection’. Up until now, I’ve won exactly one contest—after ‘losing’ 15 or 20 times. But on the other hand, I’ve met some Wonderful people and so many other talented artists—So on balance, I still think it’s pretty cool to do them and an honor to be a finalist, honorable mention, etc. As always, I wanted to say ‘Thank YOU’ again for all the support. So many great things are happening in 2015 and every bit of ‘success’ I’ve had has been a surprise to me and I’m just grateful to be able to chase my dream for a while. THE most rewarding part of playing the shows was meeting folks all over the country and getting to know them. I met so many Wonderful people and your hospitality and kind words are what kept me going. It’s as Simple as that. So ‘Thank YOU!’ for Listening, Reading, Sharing, and Helping me make this long, Crazy musical journey of mine possible…I’m really humbled by your overwhelming show of support. 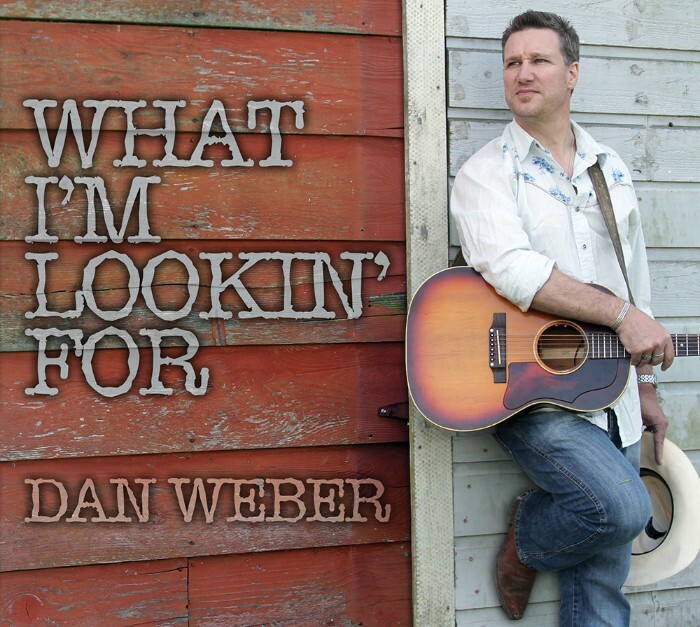 My NEW CD ‘What I’m Lookin For’ has 14 new songs including ‘(I Deal with) Crazy ALL Day’, ‘Oh Woody’, ‘Pretty Good Tonight’, and ‘Do You Ride Horses’ to name a few and several you’ve probably not heard before since I’ve not played them live. ‘What I’m Lookin For’ is my best songwriting yet so I really think you’re gonna love it! You can pick up a copy at my website at Dan Weber Music where there are links to iTunes, Bandcamp, CD Baby, etc. The ‘Ain’t Done Ramblin’ Yet’ Tour ends at the Woody Guthrie Folk Festival!! 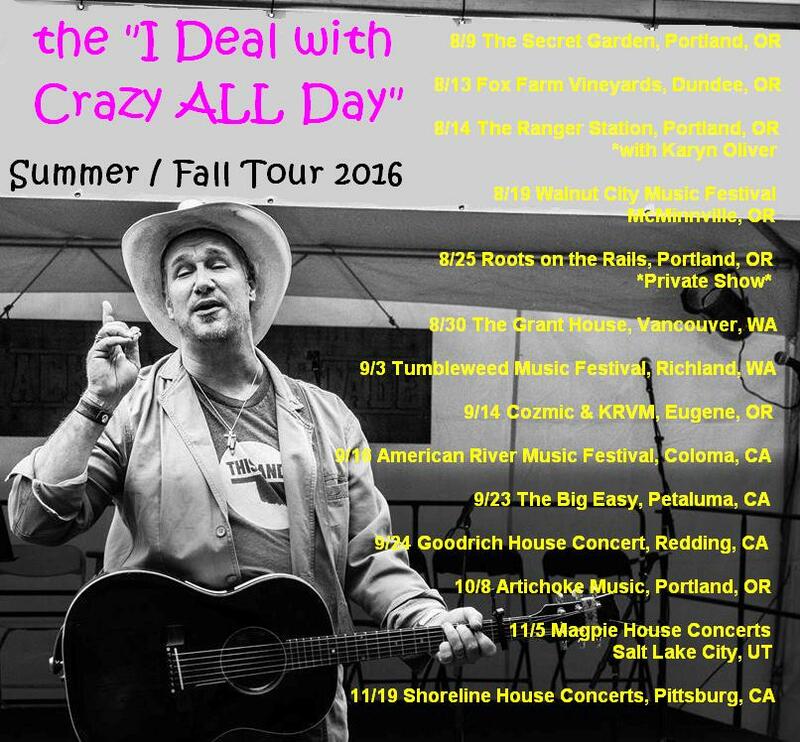 I have a handful of shows coming up—most closer to home—2 in Seattle, a couple in Portland and a few out of town. I’m honored to have been selected out of hundreds of submissions to be an ‘Emerging Artist’ at the Falcon Ridge Folk Festival in Upstate, NY and have also been selected (after 5 years of trying!) as an ‘Official Showcase Artist’ at Folk Alliance’s Far-West conference in Oakland, CA…Yup—more flights and rent-a cars—so maybe, just maybe I Ain’t Done Ramblin’ Yet after all!! ***My tribute song to Woody Guthrie—‘Oh Woody’, rose to #2 on the national Folk music radio charts in June and the new CD, ‘What I’m Lookin For’ was #6 on the charts…Whoa~Incredible!! ***For more info, on the New CD, see ‘What I’m Lookin For’ below! Lastly, I wanted to say ‘Thank YOU’ again for all the support. So many great things are happening in 2015 and every bit of ‘success’ I’ve had has been a surprise to me and I’m just grateful to be able to chase my dream for a while. THE most rewarding part of playing the shows was meeting folks all over the country and getting to know them. I met so many Wonderful people and your hospitality and kind words are what kept me going. It’s as Simple as that. So ‘Thank YOU!’ for Listening, Reading, Sharing, and Helping me make this long, Crazy musical journey of mine possible…I’m really humbled by your overwhelming show of support. 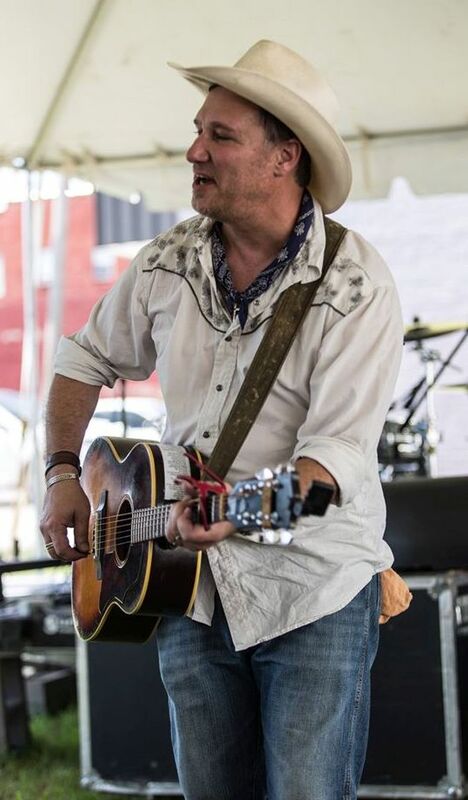 ***‘What I’m Lookin For’ has 14 new songs including ‘(I Deal with) Crazy ALL Day’, ‘Oh Woody’, ‘Pretty Good Tonight’, and ‘Do You Ride Horses’ to name a few and several you’ve probably not heard before since I’ve not played them live. ‘What I’m Lookin For’ is my best songwriting yet so I really think you’re gonna love it! You can pick up a copy at my website http://danwebermusic.com/music/wilf.html where there are links to iTunes, Bandcamp, CD Baby, etc. The “Ain’t Done Ramblin’ Yet Tour” has begun!!! 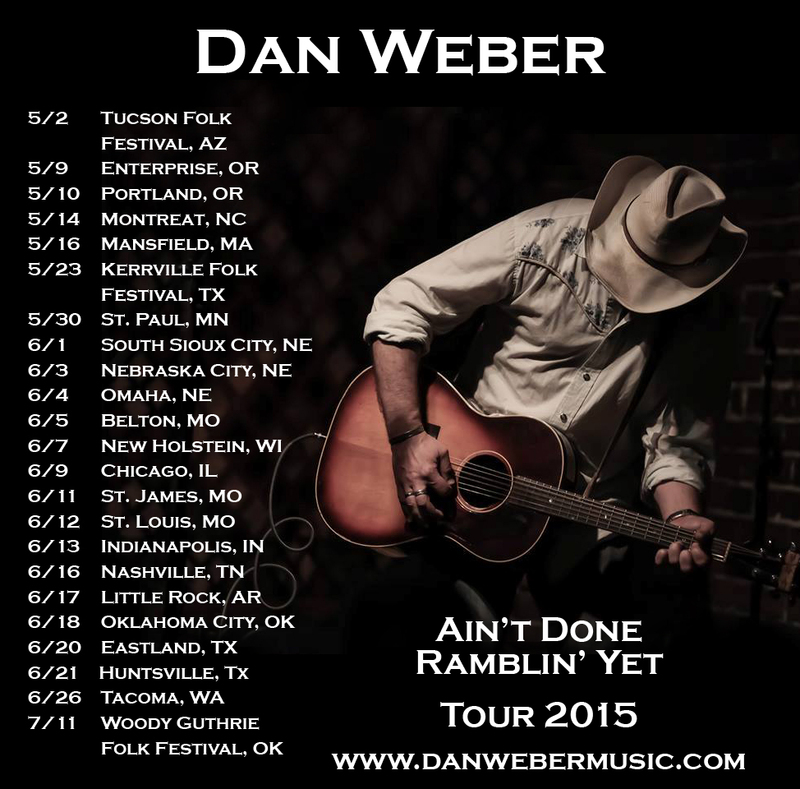 The “Ain’t Done Ramblin’ Yet Tour” has begun and it’s turning into an Epic journey!! There are some incredible shows coming up including the Woody Guthrie Folk Festival. Come see a show~and if you can’t, please tell your friends and family in those parts—I’d Love to see them at a show and meet ‘em!! And there’s MORE Dates to come!!! “Dan, I have to tell you that I’ve been to over a hundred house concerts in the last 5 years and yours tonight was the MOST energizing of any and SO MUCH FUN!!! Smiling, laughing, singing, and relating to you were an every second occurrence! Thanks for sharing your energy, personal stories, and inner spirit.” – Cindy H.
‘THANK YOU!’ for all the support. Every bit of ‘success’ I’ve has come because folks have embraced me and I’m just grateful to be able to chase my dream a bit. THE most rewarding part is playing the shows and meeting folks all over the country and getting to know them. I meet so many Wonderful people and your hospitality and kind words are what keeps me going. It’s as Simple as that. So Thanks for Listening, Reading, Sharing, and Helping me make this long, Crazy musical journey of mine possible…I’m really humbled by your enthusiasm and show of support. 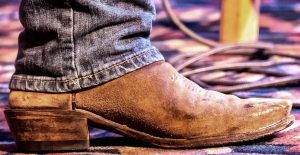 ‘What I’m Lookin For’ is 14 new songs including ‘(I Deal with) Crazy ALL Day’, ‘Oh Woody’, ‘Pretty Good Tonight’, ‘Do You Ride Horses’ and several you’ve probably not heard before. It was recorded at the same studio with the same team as ‘Ash and Bone’ and it’s my best songwriting yet—so I think you’re REALLY gonna love it!! You can pick up a copy at my website http://danwebermusic.com/music/wilf.html where there are links to iTunes, Bandcamp, CD Baby, etc. Thanks for getting a copy!! Winner of the 2015 Performing Songwriter Contest!! Oh man, after an EPIC Official showcase at the Southeast Regional Folk Alliance (SERFA) conference near Ashville, N. Carolina, I made a mad dash for Greensboro, NC on Saturday morning, then flew to Providence, RI (via Philadelphia) and played in the Rose Garden Coffeehouse’s 23rd annual Performing Songwriter Contest. Here’s a few photos from the night including one with my fellow contestants Tom Smith of Dedham, Mass., Christine DeLeon of New Jersey, and Steve Ide, artist director of the Rose Garden Coffeehouse after the contest on Saturday, May 16, 2015. 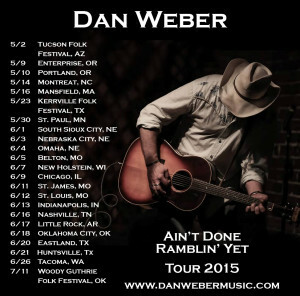 Announcing the ‘Ain’t Done Ramblin’ Yet’ 2015 Tour!!! 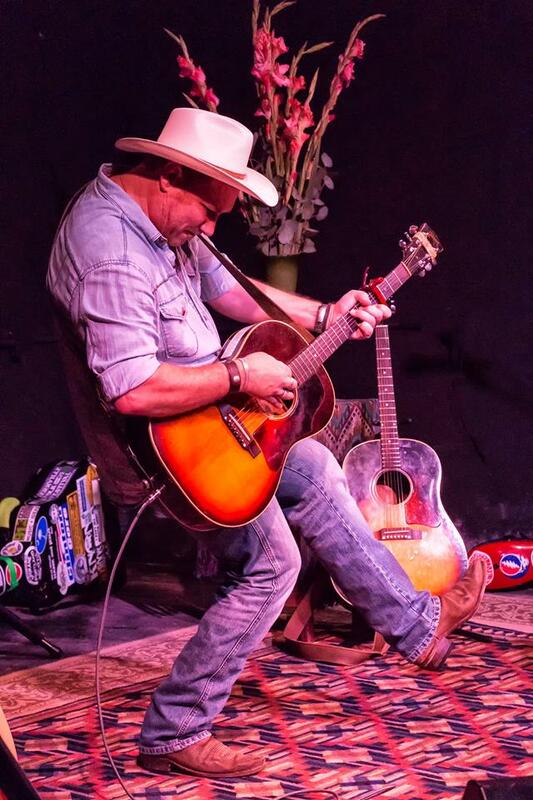 #1 The Brand NEW CD, ‘What I’m Lookin For’ was released on March 21st & 22nd at two really incredible SOLD OUT shows at Artichoke Music in Portland. Both were recorded for an upcoming LIVE CD that’s in the works down the road. I just want to say a HUGE ‘Thanks!’ to Everyone who came to the shows (and sang along!) for their show of support in selling out both nights, to my fellow musicians, to Artichoke Music and all the volunteers, and to everyone who worked so hard to make the shows so special. In short, it was FAN-tastic!!! ‘What I’m Lookin For’ has 14 new songs including ‘(I Deal with) Crazy ALL Day’, ‘Oh Woody’, ‘Pretty Good Tonight’, and ‘Do You Ride Horses’ to name a few and several you’ve probably not heard before since I’ve not played them live. ‘What I’m Lookin For’ is my best songwriting yet so I really think you’re gonna love it! You can pick up a copy at my website http://danwebermusic.com/music/wilf.html where there are links to iTunes, Bandcamp, CD Baby, etc. #3 I was also JUST selected as Finalist in the Rose Garden Coffeehouse’s 23rd Annual Performing Songwriter Competition just outside Boston, MA. I’m really excited to go back ‘East’ for a short bit before the “Ain’t Done Ramblin’ Yet Tour” starts. That’ll be right after my ‘Official Showcase’ at the SE Regional Folk Alliance conference near Ashville, North Carolina. It’s going to be a CRAZY couple of months!! Lastly, I wanted to say‘THANK YOU’ again for all the support. So many great things happened in 2014 and even more are happening in 2015. Every bit of ‘success’ I’ve has come because folks have embraced me and I’m just grateful to be able to chase my dream a bit. THE most rewarding part is playing the shows and meeting folks all over the country and getting to know them. I meet so many Wonderful people and your hospitality and kind words are what keeps me going. It’s as Simple as that. So ‘Thank YOU!’ for Listening, Reading, Sharing, and Helping me make this long, Crazy musical journey of mine possible…I’m really humbled by your enthusiasm and show of support.